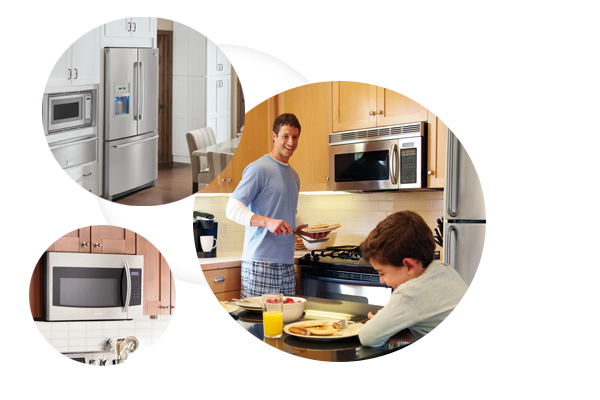 Today's microwaves offer innovative features, such as convection, grilling and steam, to quickly make delicious meals. With the ability to evenly heat and brown, you can create gourmet food in almost no time. 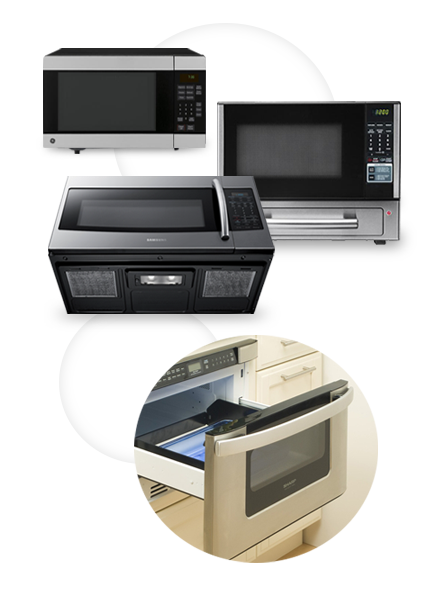 And since there are a variety of microwave sizes and designs available, you're sure to find the ideal model for your needs. Countertop microwaves come in a variety of sizes. For easy shopping, they are often sorted by size (compact, mid-size and full size), which usually correlates to the microwave's interior cubic feet (cu. ft.) measurement. Cubic feet are calculated by multiplying length times width times height in inches and dividing by 1,728. For a seamless built-in appearance, you can incorporate a trim kit with your countertop microwave. Available in a variety of sizes, most over-the-range microwaves measure 1.6 cu. ft. or larger, which means you can usually fit a 15" casserole baking dish inside. Freeing up counter space, over-the-range microwaves also feature ventilation systems that take the place of traditional oven hoods. Since an over-the-range microwave is mounted on the wall and may require ventilation work, this type of microwave needs to be installed. 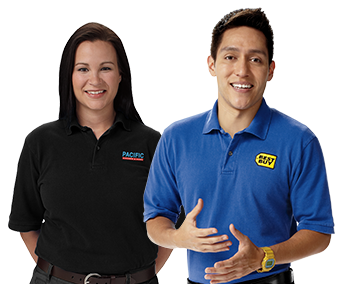 Geek Squad installation services can easily and neatly take care of this for you. Another microwave option that frees up counter space is a drawer model. Available in a variety of sizes, this type of microwave pulls out from the cabinet. A convenient option, drawer microwaves are at an easily accessible height and allow you to stir items mid-cooking without removing them from the microwave. Microwave power is measured in watts. Usually your food will cook faster and more evenly the higher the microwave wattage. You'll find microwaves available from 500 – 1,000 watts. In general, a 700-watt microwave should boil a cup of room temperature water in 2 minutes and 30 seconds. Some dorms have a limit on the microwave wattage that's allowed, so if you're heading off to school, you should check this before making a decision. Over-the-range microwaves feature ventilation systems that take the place of traditional oven hoods. You'll find external and recirculating venting options. If you don't have a form of outside exhaust available, you'll want a microwave with recirculating venting. 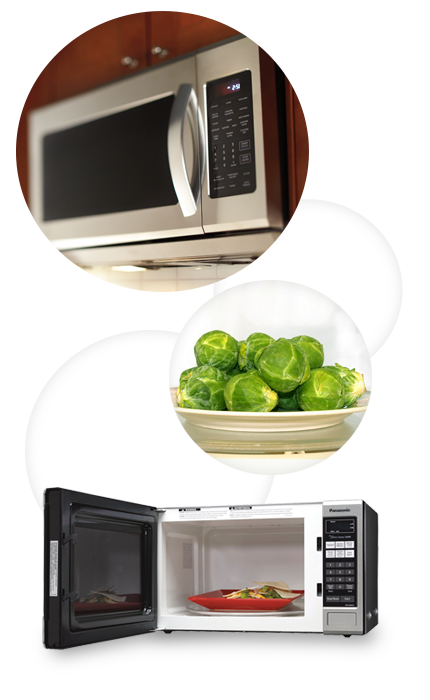 Compare venting options when considering an over-the-range microwave. Some vents offer multiple fan speeds or different types of filters. Another specification to consider is the cubic feet per minute (cfm) rating of the fan — this tells you how much air the fan moves. Many over-the-range microwaves also feature lights that make it easier to see the top of your range when you are cooking. With this feature, all you do is press a button to start cooking. Designed to defrost or cook foods for the optimal time, you can often find options for potatoes, pizza, popcorn, beverages and frozen dinners. Designed to blow heat around food for even, faster cooking, a microwave with this feature can create crusty baked goods and is able to brown foods like a broiler. Another option to offer optimal cooking, some microwaves can automatically adjust cooking time and power level based on the steam emitted from food. The microwave may even shut off if it senses that your food is too hot. Maximizing a microwave's interior cubic feet space, some include racks so you can cook multiple dishes at the same time. Created to offer steady heat at lower ranges, inverter technology maintains a consistent percentage of power. Many microwaves alternate between high and low heat when you warm something at less than 100% power. With the consistent temperature of inverter technology, it's possible to create better-quality omelets and poached fish. Samsung and Panasonic offer microwaves with inverter technology. By surrounding food with radiant heat, a grill option sears the outside of food and prevents the rubbery texture that sometimes occurs from cooking meat in the microwave. Samsung offers a feature called Slim Fry that combines grilling with warm air circulation to create crispy food inside and out, without additional oil. Offering a convenient way to quickly prepare foods like fish and vegetables, a steam option keeps food moist without adding fat. This gentle cooking method also allows you to poach eggs in your microwave. Some microwaves feature non-porous interiors made of materials like porcelain enamel or stainless steel. These materials make it easy to wipe away spills, splatters and dried-on foods. No matter which type of microwave you purchase, you'll need to make sure it fits in your space. Countertop microwaves can be easy to move, but you should carefully measure the length and width of your counter space, as well as the distance between your counter and upper cabinet and match those measurements to the product specifications. Keep in mind that full-size countertop microwaves are quite large — similar in size to one you'd place over your range. Over-the-range microwaves also require careful measurement of the upper cabinet space as well as the distance from your cooktop to the bottom of your upper cabinet, which needs to be at least 30 inches. You should also make sure the wall behind your range is strong enough to support a microwave bracket, which will handle most of the microwave's weight. Lastly, keep in mind that all microwaves include a three-prong, 110V outlet for the microwave's power cord. Find a wide variety of microwaves on BestBuy.com. Your local Best Buy store also has a selection of microwaves, and Pacific Kitchen & Home premium products are now inside select Best Buy stores, so you can shop from an impressive selection of quality brands. Plus, our friendly Blue Shirts are there to answer questions and help with choosing the best microwave for your needs.